Trump's Election Leaves Scientists In A Climate Of Uncertainty : The Two-Way At a meeting in San Francisco, thousands of researchers are pondering how they can influence President-elect Donald Trump's thinking on climate change. The U.S. government is a major contributor to climate research. 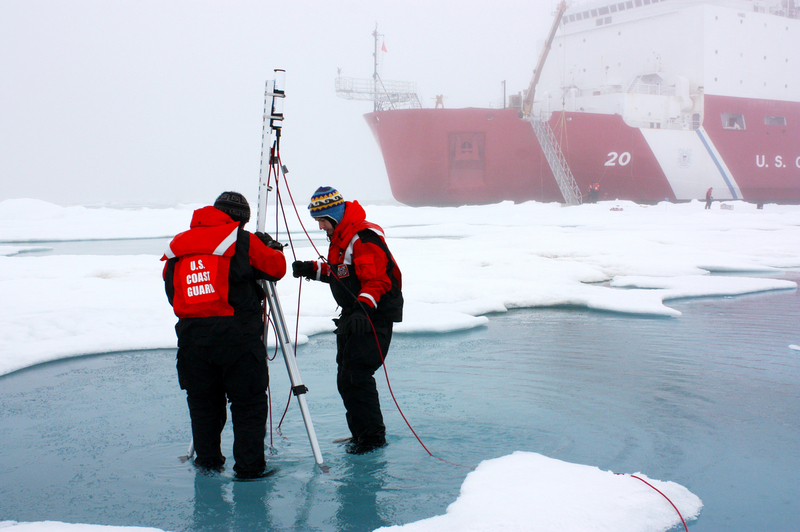 It funds missions like NASA's 2010 ICESCAPE expedition to study the decline of Arctic sea ice. Scientists attending the American Geophysical Union's fall meeting are worried Trump could have a profound effect on the effort to understand climate, and not in what they consider a good way. Peter de Menocal, dean of science at Columbia University, says he has heard colleagues express "feelings of rage, anger, confusion, fear — they're all negative emotions." "People are worried about — in extreme cases — their jobs," adds Rob Jackson, an environmental scientist at Stanford University. But, he says: "They're more worried about not being able to do their job the best way that is needed." On the other hand, Trump met with former Vice President Al Gore to talk about climate, and he has said he's open to the Paris climate agreement. Margaret Leinen, the president of the American Geophysical Union, says that leaves many scientists confused about what Trump will mean for their work. "President-elect Trump didn't have a big science agenda. That left a vacuum of uncertainty," she says. Recent signals from the Trump transition team are not reassuring. Last week, it emerged they had sent a questionnaire to Department of Energy staff looking for people who've worked on climate science. Some fear agency scientists and officials might be targeted. "A shift away from focusing on data for this planet could really leave us in the dark on how to respond to climate change," he says. Moreover, Earth observations contribute to public safety and the economy, he says. "The same satellites that look down and tell us about ... climate, are the ones that tell us about storms and agriculture." Ecologist Jim Estes worked at the U.S. Geological Survey during George W. Bush's presidency. He says in 2005, USGS suddenly decided that its scientists should submit their research to political overseers before sending it out to scientific journals. Federal agencies have now adopted rules to protect their scientists. But Estes says under the Obama administration, government scientists haven't always been encouraged to speak publicly. "This guy is such a chameleon, you have no idea what the hell is going to happen," he says. That's what people at the AGU meeting are trying to figure out. AGU's Leinen, who runs the Scripps Institution of Oceanography at UC, San Diego, says it's worth noting that previous presidents have changed their minds. She was a senior official at the National Science Foundation when George W. Bush moved into the White House. "There were several things that he said on the campaign trail regarding the environment and climate which eventually ... were moderated," she says. Leinen added a last-minute session here to talk about Trump. But she'd also like the opportunity to talk to Trump face to face about climate. Others here at the meeting have decided not to wait. They've organized something you don't often see from scientists: a public demonstration later today to tell Trump not to interfere with climate science.